Use the Windows Phone Developer Registration tool (PhoneReg.exe) to register or unregister a Windows Phone with Windows Phone OS 8.1 or Windows Phone OS 8.0. This is a stand-alone tool that’s installed when you install Microsoft Visual Studio Community 2013. It’s important to test your Windows Phone 8.x apps on a real phone. Before you can deploy apps to your Windows Phone, you have to register the phone for development. After you register your phone, you can install, run, and debug apps that target Windows Phone 8.1 or Windows Phone 8 on that phone. Note For Windows 10 devices, see Enable your device for development. Here's what you'll need in order to register a Windows Phone for development. The Windows Phone Developer Registration tool (PhoneReg.exe) is installed as part of Visual Studio Community 2013 (in the …\Microsoft SDKs\Windows Phone\<version>\Tools\Phone Registration directory). If you have a developer account, you can register three devices to use for app development, and you can publish apps to the Windows Store. If you don’t have a developer account, you can still register one device to use for app development. However, you'll need to sign up for a developer account before you can publish apps to the Store. If you try to register a device and get the error message The device name is already in use by this account, you'll have to rename the device with a unique name. You can rename a Windows Phone 8.1 device or a Windows Phone 8 device in File Explorer. To register a phone, use the Windows Phone Developer Registration tool. This is a stand-alone tool that’s installed as part of the Windows Phone development tools. Open the Windows Phone Developer Registration tool (PhoneReg.exe). You can find the tool under …\Microsoft SDKs\Windows Phone\<version>\Tools\Phone Registration\PhoneReg.exe. Tip You can also access the registration tool from within Microsoft Visual Studio 2013. On the Tools menu, select Windows Phone 8.1, then Developer Unlock. After you see the screen above, verify that the Status message displays Identified Windows Phone device , then click the Register button to unlock and register the phone. If your phone is already registered, the Status message will indicates this and you'll see an Unregister button instead. In the Sign In dialog box for your Microsoft account, enter the email address and password for your Microsoft account. Click Sign In. Note If you’re a registered developer, be sure to use the Microsoft account associated with your developer account. Your phone is now registered. You can now deploy apps to the phone. If you have trouble registering your phone, check the following requirements. Is the phone connected to the computer with the USB cable and recognized by the computer? Make sure it's shown as a drive in File Explorer. Is the phone turned on and the screen unlocked? If you have to retry registration, be sure to turn the phone on again and unlock the screen. Are the date and time set correctly on the phone? In SETTINGS | date + time, turn off the Set automatically setting and then retry registration. After registration succeeds, turn this setting on again. Are both the computer and the phone connected to the Internet? On your computer, make sure that your web browser does not have Work offline enabled. Also, you cannot connect through a proxy server that redirects to a login page, as with public networks such as those in hotels and airports. Is your Microsoft account information correct and valid? If you use more than one Microsoft account, make sure that you have signed out of the other accounts and then try again with the correct Microsoft account. Is the IpOverUsb service (Windows Phone IP over USB Transport) running on the computer? If you still have a problem, consider restarting the service. 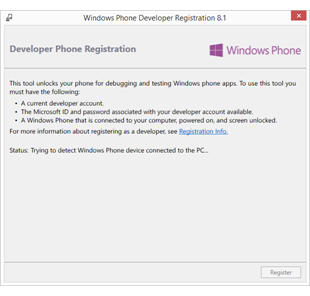 To unregister a phone, you can use the Windows Phone Developer Registration tool. You can also unregister a phone in your Windows Dev Center dashboard, even if you no longer have the registered phone. Be aware that after you unregister a phone, the apps that you deployed will no longer run on it, because the app licenses will no longer be valid. Important Windows Phone 7 devices can no longer be registered for development. If you unregister a Windows Phone 7 device, you will not be able to register it again using the Windows Phone Developer Registration tool. Connect your registered phone and run the Windows Phone Developer Registration tool, as described in this topic. When the tool detects your device, click Unregister. In the Windows Dev Center dashboard, go to the Account settings page and then click Unlocked Windows Phones in the left navigation menu. Here are some known issues that can occur when you deploy an app to a registered phone. If you deploy an app to a registered phone by using Visual Studio or the Application Deployment Tool, then you unregister the phone, you can no longer run the deployed app, even if you register the phone again. You have to uninstall the app and redeploy it to the phone. If you deploy an app to a registered phone by using Visual Studio, and the app is installed on the phone's SD card because of the user’s settings, the app is not encrypted on the SD card. If you deploy an app to a registered phone by using Visual Studio, and the phone has an SD card, the Storage Sense app indicates that the deployed app can be moved to the SD card. If you tap move to SD, however, the operation fails and the app may be corrupted. If you install an unsigned version of a published app that includes the app's Package Family Name (PFN) on a registered phone by using Visual Studio or the Application Deployment Tool, you can’t update the installed app by downloading a signed version of the app from the Store. To install an updated version of the app from the Store, you have to uninstall the unsigned version first. If you deploy an app to a registered phone, then you install an operating system update on the phone, you cannot deploy the app to the phone again (for example, while you are iteratively developing and testing the app in Visual Studio). You have to uninstall the app from the phone and redeploy it.